During Fashion Week, one of my favorite events to cover is backstage beauty, I love going behind the scenes and watching the process and inspiration come to life. So, while in Miami last weekend I was invited backstage with Zoya to check out their looks for the Swim 2014 Collections. Not only are their people the sweetest, but the looks were killer and had the perfect pop out on the runway. The look from Suboo was more of a chic scuba white (using Purity) topped with a custom matte finish, it gave the right amount of pow without being over the top next to the disheveled wet look hair and smoky eyes. As you can see, white is sticking around. Note the lucite cuffs, amazing right? 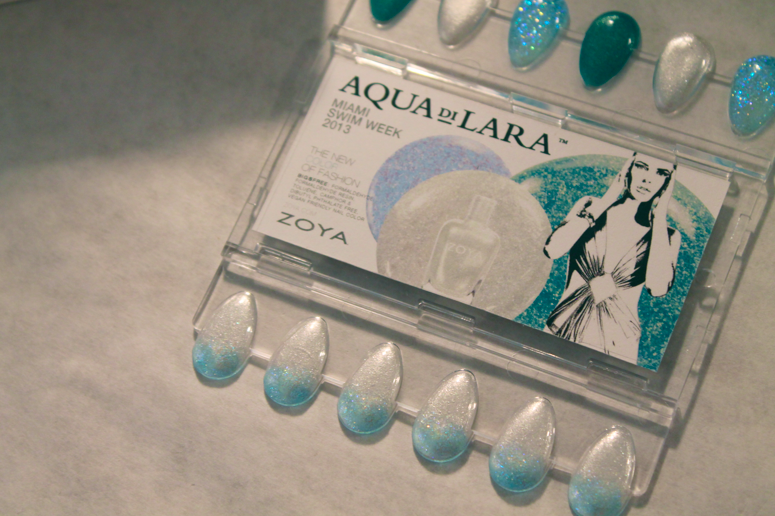 At Aqua Di Lara, Zoya went for a more gradient inspired look with just a touch of shimmer. Starting off with the base of Ginessa and topped off with a little sparkle on the tips from never seen before, Mosheen. The look was then completed with Zuza on the toes, for optimal mermaid chic perfection. Which look would you try? I'm going with both! Those nails will be great on you. And I really like the white color. It is so cool. how unique...these are paired perfectly for swim suits. i love the ombre colors! I love the colors of the nails. And you are right those cuffs are great. i love zoya polishes! the mermaid inspired colors are so pretty! I love that white/off-white polish is making a comeback. Definitely want to try this soon! So cool you got to go backstage! So funky...I love how nails have become such a focal point! I really love Zoya products, and those nails are amazing! How exciting is that! I would LOVE to do that! I have never tried Zoya. I will have to look in to trying it. Gorgeous nails!! I'm particular to the glitter gradient. wow, I love the light nail trend for Summer! Like your blogs, thank you for sharing. We loved seeing you at the shows!